Tuesday was a hugely important day, which seems like stating the obvious but this is actually backed up by the numbers. 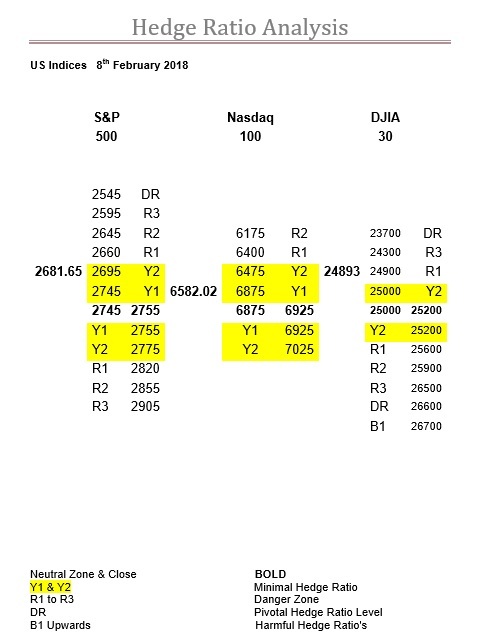 The ratio table on the 31st Jan had R3 in the SPX at 2595, just like today’s, and the low on Tuesday was 2593.07, please note the lows on this day in both the DJX and NDX. Tuesday’s table had R1 at 2695, the close was 2695.14. Today’s table has the market back in the Y ratios, which as one can see are tumbling, and just to add more to the flames it is the rollover next week, although it may just be that where the zone is, if it can hold there, could be the SPX’s saving grace. The only change in the NDX’s ratio table above is R2 drops to 6175 from where it was on Tuesday, 6375. The low here on that day was 6370.48. The close was 6665.98 but anywhere above 6400 was back into their massive Y ratio bandwidth. Regarding rollover Wednesday we would totally expect the zone to change, most probably reverting to 6775-6825 initially, but in truth almost anywhere in the Y1 ratio bandwidth is possible. In Tuesday’s ratio table for the DJX the DR level was at 23800, and the low on that momentous day was 23778. By the close it had recovered to 24912, which was back into their Y ratio bandwidth, just like the SPX, although to a greater extent. The zone has changed, although as a target for next Wednesday this is now eminently achievable, but in the meantime 24900 is a serious and very significant level, as well as now being the demarcation line between the Y and R ratios. The other main aspect to note is the type of activity, which suggests the bulls are back even if the ratio movement does not. Thank you, I’ve just been searching for info about this subject for a while and yours is the greatest I have discovered so far. But, what in regards to the bottom line? Are you sure concerning the source? Good day! I just wish to give an enormous thumbs up for the good info you will have right here on this post. I will probably be coming again to your blog for more soon.